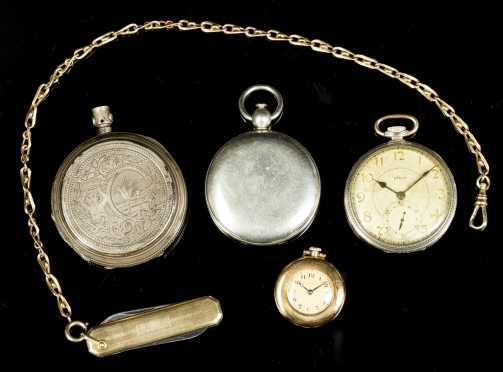 Lot of Pocket Watches, Compass, and Pocket Knife in Gold and Silver, A) Ladies 14kt. 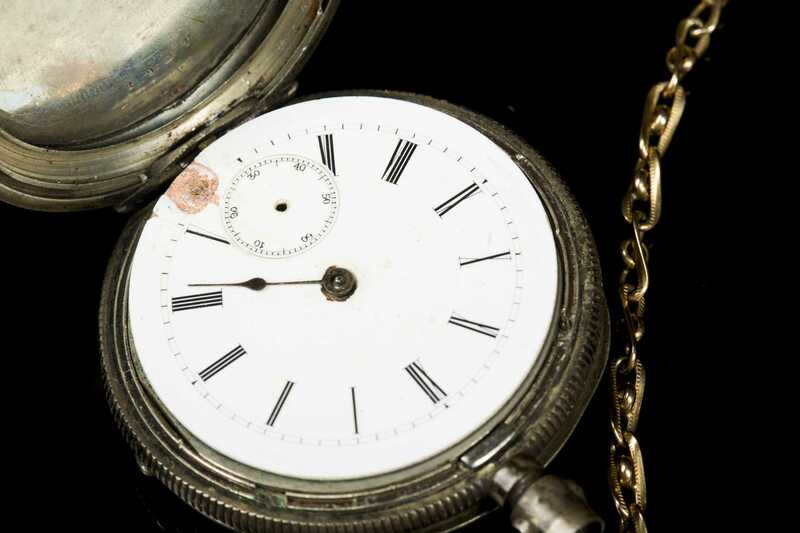 gold marked Waltham pocket watch, gold tone face shows some wear, crystal is in fine shape and the sleek simple case is in fine shape. The back case interior is stamped "Pat. May 11, 1915 Dubois W.C.Co. 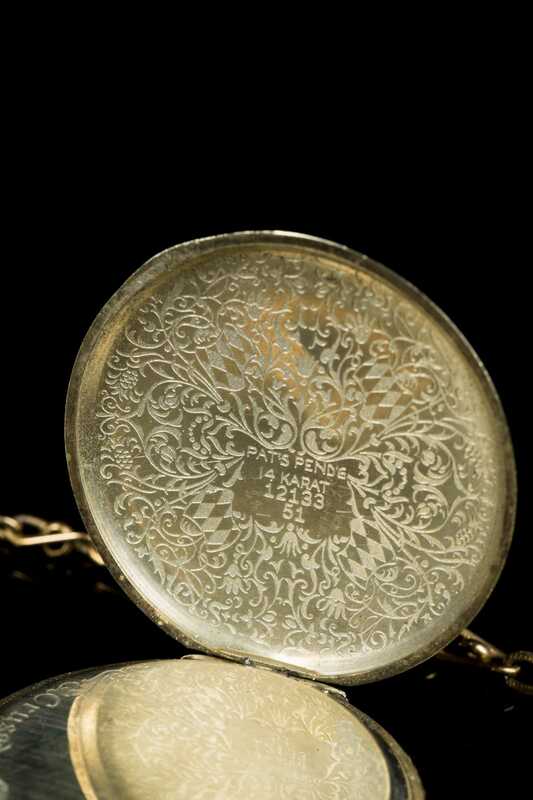 14k 0.555 fine Guaranteed, 468606" measures 1 1/8" diameter and 17.7g. 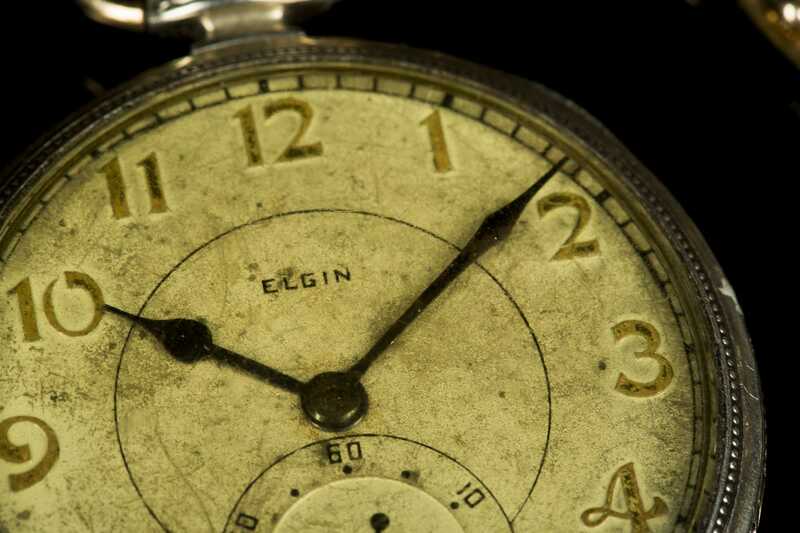 B) Elgin 14kt. 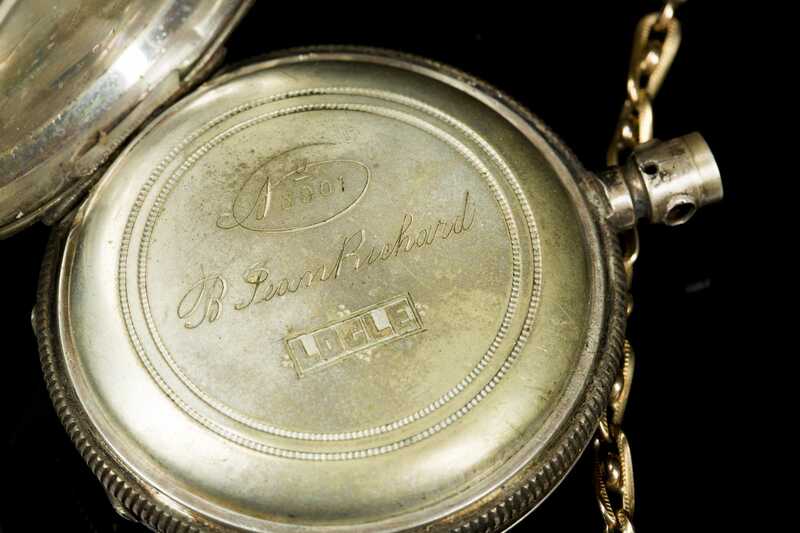 white gold pocket watch, face is discolored but not cracked, crystal is intact, interior case marked "Pat's Pendg 14karat 12133 51, Elgin Crusader" back case does not close tightly, diameter measures approx. 1 7/8" and weighs 52.7g. 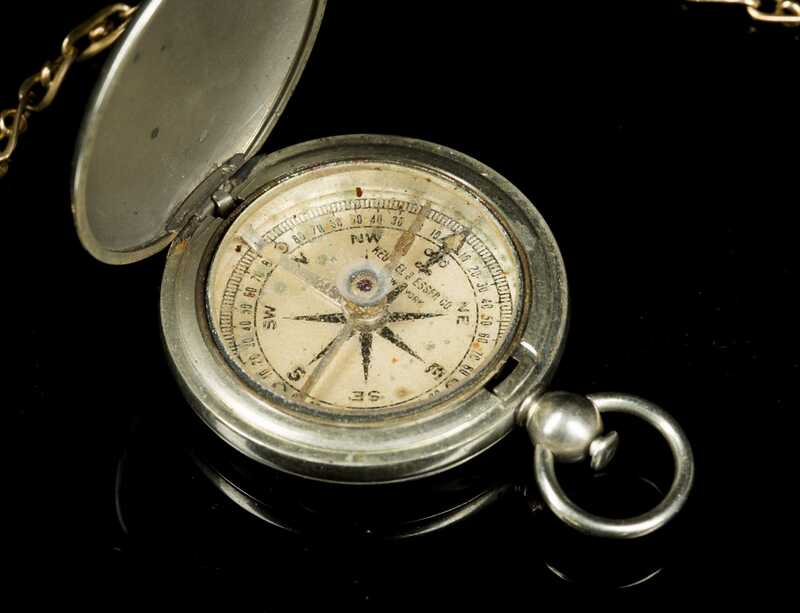 C) Keuffel & Esser Co. New York silver tone compass, unmarked and could be plated or base metal. Glass intact and some spotting to compass face, approx 2" diam. and weighs 45.9g. 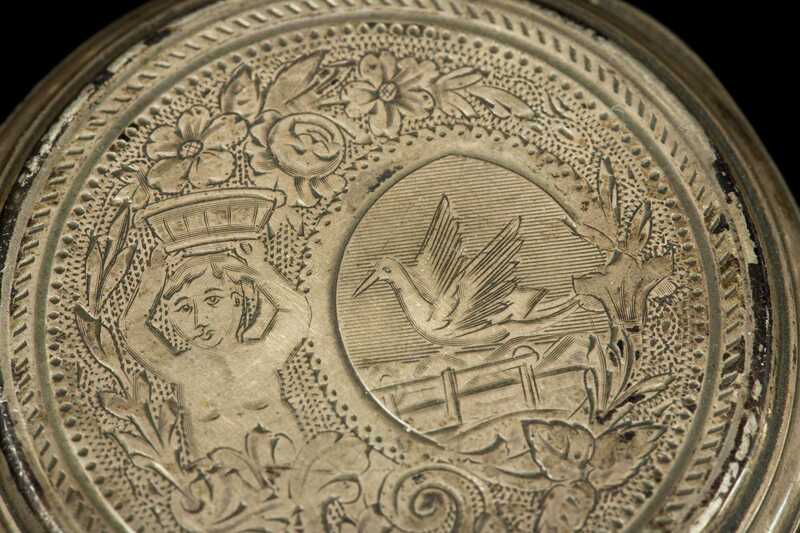 D) Sterling silver pocket watch, case elaborately decorated with figure and bird, missing top fob and crystal, rim holding to hold crystal is loose, face is cracked and has area of loss, the back interior casing is marked "No. 8901 B Jean Richard, Logle, 0,800" weighs 105g and measures 2 1/8" diameter. D) Gold filled double blade pocket knife on GF chain, bail is stamped "L.MFG 1/20-12k" the chain is also stamped "GF" total length 15 1/2" and weighs 23.5g.